Acidity - You can have acidity problems by skipping breakfast in the morning. 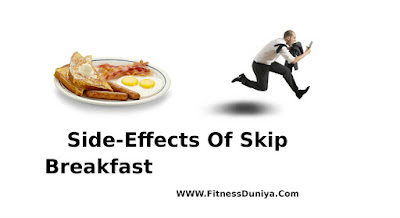 To give energy in the body you need to eat good healthy breakfast in the morning.After taking dinner,your body is hungry for 8 to 9 hoursIf you skip your morning breakfast or not eat properly,then the acid begins to form in the body.Due to which many problems like stomach pain and bile begin. Gain Weight - If the breakfast of morning is missed, then the chances of weight gain of the person increases.So take proper breakfast,do you know vegetables are very important in a healthy breakfast. There is a low calorie intake naturally. Fiber-rich vegetables meet the needs of the body and keep the person satisfied throughout the day. Stress - After being hungry for seven to eight hours at night, the body needs energy which gets us from good breakfast. If you do not have breakfast, your body is forced to take glucose from your tissues.Because of this, you are feeling weak and tired all day. Migraine Pain - By not eating breakfast,the sugar level drops sharply, due to which a hormone release begins to balance the low glucose level. This leads to increased blood pressure levels and migraine attacks occur. Increase The Chances Of Diabetes - Those who leave their morning breakfast are at risk of having type 2 diabetes in future. Heart Disease - Those who do not have breakfast, they have more chances of heart attack and other heart related problems.Research has shown that if people do breakfast early in the morning, their heart is always healthy.